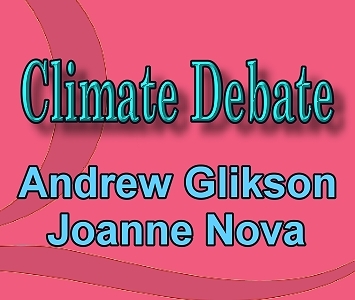 I respond to criticisms by Joanne Nova (JN) as in her article “No, Dr Glikson” (Quadrant Online, 21.4.2010) of my article “The origin and consequences of climate change” (Quadrant Online, 21.4.2010), basing my comments on recent climate change reports, including among other the Copenhagen Synthesis Report, 2009; Four Degrees and Beyond conference, 2009; Steffen, 2010 and CSIRO-BOM. I point to statements inconsistent with instrumental measurements and direct observations and to misunderstanding of atmosphere/ocean climate processes. 1. 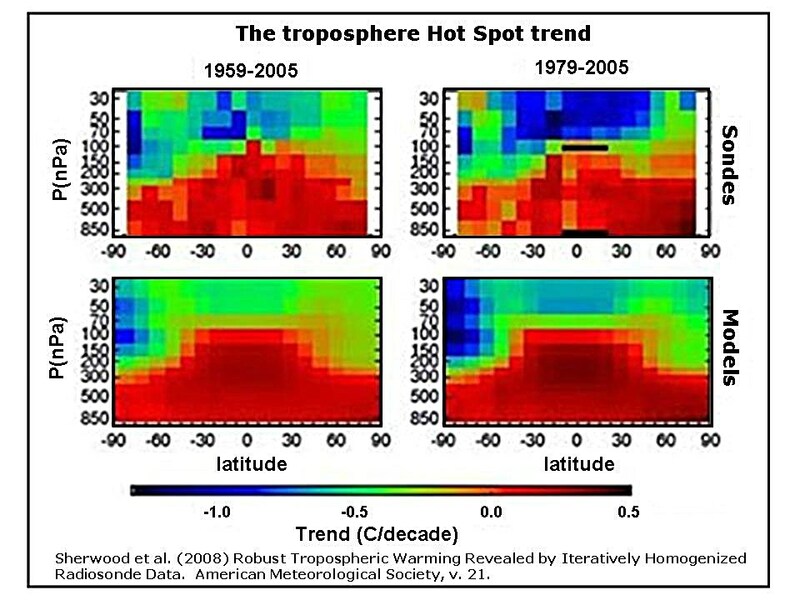 The troposphere hot spot (whose presence and intensity is related to global temperatures). JN states: “The models are wrong. The “Hot Spot” is missing. The net effect of the warming due to man-made CO2 has been exaggerated”. Response by AG: The consequences of global warming, whether from natural or anthropogenic factors, do not in themselves identify the origin of climate change, it is the identification of the external forcings which does, i.e. solar, volcanic or anthropogenic. JN’s information regarding the troposphere hot spot (2006) is outdated. More recent studies (Sherwood et al., 2008) have identified the troposphere hot spot (see Figure 1), stating “stronger warming is shown in the Northern Hemisphere where sampling is best” . 3. Melting of the cryosphere. JN states: “Then there’s the problem that global sea ice is looking fairly robust. The Arctic has shrunk some, but the Antarctic has grown”. Response by AG: Freezing and melting of thin sea ice constitute seasonal to perennial-scale variations. It is the decade-scale behaviour of the several kilometres-thick continental ice sheets which represents climate trends. Arctic sea ice has declined while Antarctic sea ice fluctuates strongly with the seasons, with only about 3 to 4 million square kilometre remaining at summer’s end and with trends varying around the Antarctic continent. Response by AG: The relations between atmospheric CO2 and oceanic CO2 are governed by partitioning coefficients dependent mainly on temperature. The transition from the carbonate ion (CO3[-2]) which calcifying organisms use to bicarbonate and carbonic acid which organisms can not use, which occurs about 8.2-8.1, is critical for marine life, as indicated by the summary statement by the symposium on “The Ocean in High-CO2 World” 6-9 October, 2008. 5. Excess CO2 – beneficial or harmful for plants? “Writing in the journal Science, researchers concluded that elevated atmospheric carbon dioxide actually reduces plant growth when combined with other likely consequences of climate change — namely, higher temperatures, increased precipitation or increased nitrogen deposits in the soil”. "To understand complex ecological systems, the traditional approach of isolating one factor and looking at that response, then extrapolating to the whole system, is often not correct," Mooney said. "On an ecosystem scale, many interacting factors may be involved." Global warming constitutes the direct consequence of the emission of 370 billion tons (GtC) of carbon, namely more than 60% of the original carbon concentration of the atmosphere pre-1750 (590 GtC), as well as extensive deforestation and clearing, methane release from animals and nitric oxide release from fertilisers. Some 46% of the CO2 stays in the atmosphere (a dynamic balance which changes as the oceans warm), imparting radiative forcing of about 1.66 Watt/m2, consistent with basic physics of greenhouse gas resonance and infrared absorption/emission effects. The rise of atmospheric CO2 concentrations from the top interglacial level of 280 ppm to the current 389 ppm, the highest level recorded since 2.8 million years ago, is proceeding at a rate of c.2 ppm/year, unprecedented in the geological record (bar major volcanic periods, asteroid impacts and eruption of methane). As indicated by the vast peer-reviewed literature, every alternative mechanism potentially underlying climate change has been examined, including solar cycles, cosmic rays, ocean current patterns, the ENSO cycle and other factors. Following a small rise in insolation during the first part of the 20th century (c. 0.2 Watt/m2), solar radiation follows the 11 years sunspot cycle of about c. +/-0.1 Watt/m2 since the mid-20th century, accompanied by corresponding oscillations of cosmic rays. The total rise in insolation since 1750 is estimated as c. 0.12 Watt/m2. Advances in the study of the atmosphere-ocean-cryosphere system in the during the last 800,000 years using the ice cores, and during the last 34 million years using multiple proxies (fractionation of oxygen, carbon and boron isotopes between plankton, water and the atmosphere, fossil plant pores [stomata]), indicate high climate sensitivities (i.e. response of global temperatures to CO2 variations), above 5 degrees C per doubling of atmospheric CO2. During the mid-Pliocene (2.8 – 3.0 million years ago) and mid-Miocene (14-16 million years ago) CO2 levels were about 400+/-50 ppm and mean global temperatures about 3 to 4 degrees Celsius higher than 18th century levels, suggesting that, at 389 ppm CO2, climate change is tracking toward similar conditions. 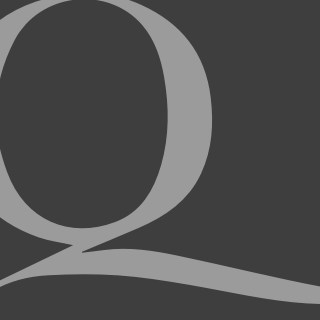 Response by AG: Courts of law don’t deal with scientific questions. Clouds follow the laws of atmospheric physics and chemistry, which climate science investigates. As in other fields of science and technology, credibility lies with the respective experienced authorities and is protected, as much as humanly possible, by the peer review system, which attempts to ensure publications are consistent with the data base, direct field observations, correct calculations and the basic laws of physics and chemistry. The CRU E-mails. Play the ball not the man. That individual scientists used terms in personal E-mails, or objected to publication of what in their view are unfounded claims, as part of the peer review process, hardly reflect on the scientific discipline as a whole and in no way detract from the overwhelming reality of ice melting, sea level rise, the polar-ward shift in climate zones, the increasing frequency of droughts and extreme weather events around the globe. It will be interesting to know what amount of direct observations and physical and chemical evidence for the past and present behaviour of the atmosphere-ocean-cryosphere system would convince societies to pause before continuing to use the atmosphere as an open channel for the emission of some 8 billion tons of carbon per year. A. 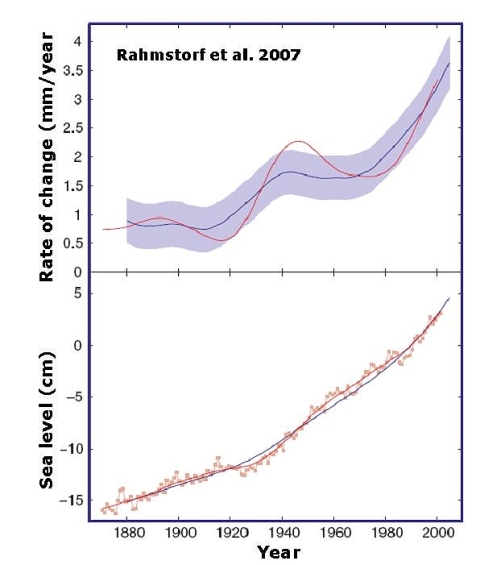 Rate of sea-level rise obtained from tide gauge. B. Sea level relative to 1990 obtained from observations. Rahmstorf et al. 2007. Science 315. Sherwood et al., 2008: Robust Tropospheric Warming Revealed by Iteratively Homogenized Radiosonde Data. American Meteorological Society, v. 21. Science, vol 298, pp. 1903-1904. Schneider & Schneider, 2010 (http://www.nature.com/ngeo/journal/v3/n1/abs/ngeo736.html).